Our word for today is "shadow." I've written about shadows before - The shadow knows. Shadow is an old word, from the mid 1300s in Old English via Dutch and German and possibly, Greek. Such a word will have developed many meanings. 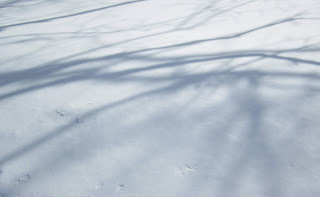 Ultimately, shadow means the interruption of light by something opaque. This is its technical definition - block the sun and create a shadow. It has, however, developed a deep, emotional subtext. To live in the shadow of a person "greater" than yourself, must be a sad existence. Always an after thought, the second to be hugged, congratulated, remembered or not, as the case may be. Some very shy people might welcome such an existence - "She didn't mind living in her husband's shadow." For others, this would be a second-hand life. Evil has always lurked in shadows. We hide in the shade, when we have something to hide. Mysterious figures wear dark glasses to mask their eyes, their souls. Shakespeare referred to ghosts as shades, the spirit or shadow of person who once lived. At one point, in your childhood, you discover your shadow. Some elementary school teachers build whole lessons around this discovery. In fact, for some the fascination with their shadow never ceases. I remember once reading a proviso on a photography site that accepted images for sale. The line read - Please, no pictures of the photographer's shadow. 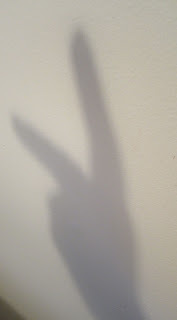 One of my favourite lessons, when I taught Theatre Arts, was shadow plays. Somehow removing the body from the performance created something surreal. Even vignettes with hand shadows were magical. Peter Pan lost his shadow. Does that mean he has no dark side, no lurking evils - the innocent child, forever? Then there is the enigmatic quote from Ursula Le Guin, "To light a candle is to cast a shadow."